For 100 years, New Hampshire has been the place where presidential candidates have debated war, taxes, abortion, and the best way to flip a pancake. But the 2020 New Hampshire primary may go down as historically remarkable because of one issue for which there is apparently no debate: legalizing marijuana. Some 27 years after Bill Clinton insisted that he “didn’t inhale,” every candidate for president, including the Republicans, have agreed on some form of ending the prohibition on cannabis. Most Democrats say they favor what Canada just did, passing a national law legalizing the substance for adult recreational use. President Donald Trump is on record saying he is OK with it as a state-by-state issue with the federal government out of the way. While these days it is stunning to find an issue where all candidates from both parties agree, it falls in line with how the national mood has changed. In 2008, 35 percent of Americans supported the legalization of cannabis. Today, a little over a decade later, it is 62 percent, according to the Pew Research Center. Also during that period, 10 states and the District of Columbia have legalized the substance for adult use. Yes, so far all candidates for president support it — from Democratic moderates like Minnesota senator Amy Klobuchar to liberals like Vermont senator Bernie Sanders. In addition to Trump’s states’ rights approach, his Republican opponent, former Massachusetts governor Bill Weld, has been deeply involved in the legalization movement. More than any other early presidential primary state, the issue of cannabis legalization will be a focus in New Hampshire. This is for no other reason than the Legislature, led by Democrats, is expected to pass a bill legalizing, regulating and taxing cannabis only for Republican governor Chris Sununu to veto the bill. 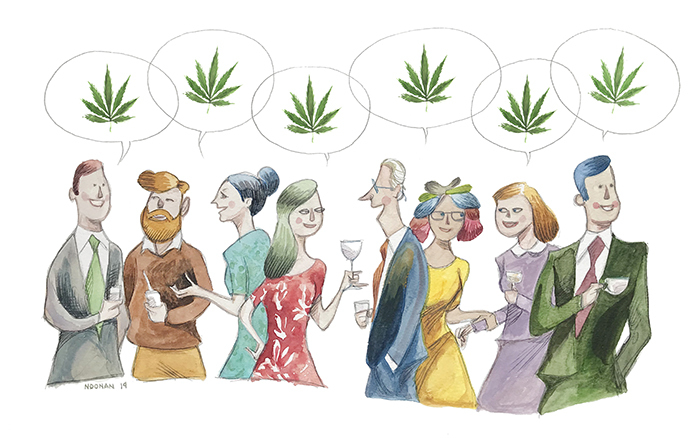 It is unclear at the moment whether the bill has enough votes to override Sununu’s veto, but it is notable that all states around New Hampshire, including Vermont, Massachusetts, Maine and even Canada, have passed laws legalizing it for adult use. But one thing could preempt all the talk about cannabis during the New Hampshire primary this time around: Trump. Trump has said that he is willing to sign a bill that lets states experiment with legalization by decriminalizing small amounts and allows legal cannabis business to conduct banking transactions. A similar bill was sponsored by Massachusetts senator Elizabeth Warren, a Democrat, and Colorado senator Cory Gardner, a Republican. Just having politicians open to legal cannabis is still a long way from it becoming legal, but in our politically polarized nation, this might be the one of the few issues most people agree upon.